Will Hoskins' last-minute winner sent Bristol Rovers into the Johnstone's Paint Trophy area quarter-finals at the expense of a battling Aldershot. The Shots spurned a great opportunity to take the lead after Jeff Hughes felled Jermaine McGlashan in the area. Luke Guttridge stepped up but Mikkel Andersen made the save to keep the scores level. Hoskins was then on hand to fire in a bullet volley in the 90th minute from Charlie Reece's cross to settle it.
" It was a good win for us, because it was never going to be an easy tie after a tough, high profile match against Huddersfield on Saturday. "I thought it culminated in a good second half when we passed it well, penetrated well and if it wasn't for their keeper, could have won comfortably. "To their credit they did cause us some problems on a number of counter-attacks, obviously one leading to the penalty, but the possession and chances we had made us worthy winners"
"The reaction you got from the Bristol Rovers bench said it all, they were over the moon. "I don't know how games have gone at this stadium, but we were probably 65% possession, we had about 12 corners, missed a penalty. We passed the ball around well today. "[Jermaine] McGlashan who we got from Ashford Town, it's the first time he's played professional football and he was terrific. He got the penalty. And that's the second penalty we've missed. The next penalty will not be placed, I've told them, just smash it." 90:00+3:54 The referee blows for the end of the match. 90:00+3:30 The ball is sent over by Luke Guttridge, save by Mikkel Andersen. 90:00+2:59 The ball is sent over by Wade Small, clearance by Wayne Brown. 90:00+2:03 Will Hoskins concedes a free kick for a foul on Wade Small. Jamie Young takes the direct free kick. 90:00+0:57 Booking Will Hoskins is cautioned by the ref for unsporting behaviour. 89:38 Charles Reece provided the assist for the goal. 89:38 GOAL - Will Hoskins:Bristol Rovers 1 - 0 Aldershot A goal is scored by Will Hoskins from close range to the top right corner of the goal. Bristol Rovers 1-0 Aldershot. 88:22 Foul by Byron Anthony on Damian Spencer, free kick awarded. Luke Guttridge has an effort direct from the free kick. 88:07 Wayne Brown takes a shot. Save made by Jamie Young. 87:56 Charles Reece takes a shot. Save by Jamie Young. 87:15 Corner taken right-footed by Luke Guttridge from the left by-line, save made by Mikkel Andersen. 87:00 Luke Guttridge takes a short corner. 86:51 Luke Guttridge takes a shot. 85:33 Stuart Campbell is adjudged to have handled the ball. Wade Small takes the indirect free kick. 85:06 John Halls fouled by Eliot Richards, the ref awards a free kick. Jamie Young restarts play with the free kick. 84:40 Jermaine McGlashan sends in a cross, Mikkel Andersen makes a save. 83:37 Will Hoskins takes a shot. Jamie Young makes a save. 82:48 Substitution Ben Harding is brought on as a substitute for Emmanuel Panther. 82:16 Substitution (Bristol Rovers) makes a substitution, with Eliot Richards coming on for John Akinde. 82:05 Effort from the edge of the box by Will Hoskins goes wide of the right-hand upright. 81:25 Centre by Stuart Campbell, Aaron Morris makes a clearance. 80:42 Stuart Campbell takes the outswinging corner, clearance made by Emmanuel Panther. 79:37 Danny Hylton concedes a free kick for a foul on John Akinde. Will Hoskins has a direct shot on goal from the free kick. 79:37 Booking The referee shows Danny Hylton a yellow card for unsporting behaviour. 77:33 Effort on goal by John Akinde from just inside the penalty box goes harmlessly over the target. 76:48 Charles Reece takes a shot from 12 yards. Save by Jamie Young. 76:35 The ball is swung over by Anthony Straker, clearance made by Jeff Hughes. 76:08 Short corner taken by Luke Guttridge. 75:41 A cross is delivered by Wayne Brown, clearance made by Aaron Morris. 75:23 A cross is delivered by Jeff Hughes, save by Jamie Young. 74:16 Free kick awarded for a foul by Wade Small on Stuart Campbell. Stuart Campbell crosses the ball in from the free kick, Anthony Straker manages to make a clearance. 73:55 The ball is swung over by Charles Reece, John Halls manages to make a clearance. 72:38 Stuart Campbell gives away a free kick for an unfair challenge on Luke Guttridge. The free kick is delivered right-footed by Luke Guttridge from right wing. 70:09 Damian Spencer produces a cross, Jeff Hughes manages to make a clearance. 68:40 Luke Guttridge takes a outswinging corner from the right by-line played to the near post, clearance made by Stuart Campbell. 67:59 Foul by Danny Coles on Damian Spencer, free kick awarded. Direct free kick taken by John Halls. 66:16 Outswinging corner taken by Stuart Campbell, clearance by Danny Hylton. 66:04 Jeff Hughes takes a shot. John Halls gets a block in. 65:38 Corner from the left by-line taken by Wayne Brown, clearance made by John Halls. 63:32 Substitution Wayne Brown is brought on as a substitute for Dominic Blizzard. 63:00 Floated corner taken right-footed by Luke Guttridge from the right by-line, Danny Hylton produces a header from inside the area that goes over the bar. 62:44 Penalty taken by Luke Guttridge saved by Mikkel Andersen. 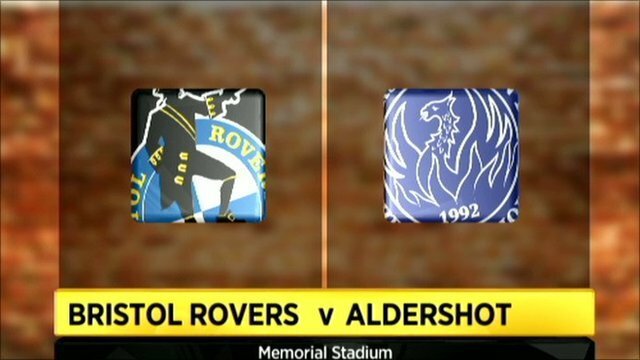 Bristol Rovers 0-0 Aldershot. 61:35 Penalty awarded for an unfair challenge on Jermaine McGlashan by Jeff Hughes. 60:54 Wade Small takes a shot. Save made by Mikkel Andersen. 59:55 Corner taken right-footed by Stuart Campbell, save by Jamie Young. 59:00 Corner taken by Luke Guttridge from the right by-line played to the near post, Jeff Hughes manages to make a clearance. 57:48 The ball is crossed by Will Hoskins. 57:24 The referee blows for offside. Free kick taken by Danny Coles. 56:13 Corner taken by Luke Guttridge from the right by-line. 56:06 The ball is swung over by Jermaine McGlashan, blocked by Byron Anthony. 54:30 Luke Guttridge takes a shot. Brilliant save by Mikkel Andersen. 53:34 Outswinging corner taken by Stuart Campbell from the right by-line, Clayton Fortune makes a clearance. 53:21 Jeff Hughes takes a shot. Save by Jamie Young. 52:30 The official flags Jermaine McGlashan offside. Mikkel Andersen takes the free kick. 51:22 The referee blows for offside against Will Hoskins. Free kick taken by Jamie Young. 50:32 John Akinde takes a shot. Jamie Young makes a save. 50:12 Foul by Danny Hylton on Stuart Campbell, free kick awarded. Free kick taken by Mikkel Andersen. 49:26 Will Hoskins takes a shot. Brilliant save by Jamie Young. 49:17 John Akinde sends in a cross, clearance made by Aaron Morris. 48:59 The ball is sent over by Jeff Hughes, Anthony Straker manages to make a clearance. 47:58 The ball is crossed by Damian Spencer, save by Mikkel Andersen. 46:15 The official flags Wade Small offside. Mikkel Andersen takes the indirect free kick. 45:01 Substitution Charles Reece is brought on as a substitute for Jo Kuffour. 45:00+1:37 The ref blows to end the first period. 45:00+0:08 Dominic Blizzard crosses the ball, clearance by Anthony Straker. 43:35 Outswinging corner taken right-footed by Luke Guttridge from the right by-line, save made by Mikkel Andersen. 39:47 A cross is delivered by Carl Regan. 38:45 John Halls produces a cross. 35:58 Foul by Stuart Campbell on Danny Hylton, free kick awarded. Free kick crossed right-footed by Luke Guttridge, clearance made by Stuart Campbell. 35:39 A cross is delivered by Will Hoskins, save by Jamie Young. 35:08 Clayton Fortune concedes a free kick for a foul on Jo Kuffour. Direct free kick taken by Carl Regan. 33:41 John Halls produces a right-footed shot from just outside the area that goes harmlessly over the bar. 32:14 Wade Small fouled by Dominic Blizzard, the ref awards a free kick. Luke Guttridge takes the free kick. 31:01 Outswinging corner taken right-footed by Stuart Campbell from the right by-line, Damian Spencer manages to make a clearance. 30:42 John Akinde takes a shot. Save by Jamie Young. 29:13 Aaron Morris gives away a free kick for an unfair challenge on Jo Kuffour. Stuart Campbell takes the free kick. 29:13 Booking Aaron Morris receives a yellow card. 28:12 Emmanuel Panther fouled by Gary Sawyer, the ref awards a free kick. Free kick taken by Luke Guttridge. 27:20 Corner taken right-footed by Stuart Campbell, John Halls manages to make a clearance. 27:08 John Akinde takes a shot. Save by Jamie Young. 25:41 Short corner taken by Stuart Campbell from the right by-line. 25:03 Jermaine McGlashan crosses the ball, Mikkel Andersen makes a save. 23:24 The referee blows for offside against John Akinde. Free kick taken by Jamie Young. 21:30 Effort on goal by John Akinde from inside the penalty area goes harmlessly over the bar. 21:22 The ball is delivered by Will Hoskins, John Halls makes a clearance. 20:29 The ball is swung over by Gary Sawyer, clearance by Danny Hylton. 17:30 John Halls concedes a free kick for a foul on Jeff Hughes. Mikkel Andersen restarts play with the free kick. 16:04 Free kick awarded for an unfair challenge on Carl Regan by Danny Hylton. Jeff Hughes restarts play with the free kick. 14:54 The referee blows for offside. Free kick taken by Mikkel Andersen. 14:32 Luke Guttridge takes a short corner. 14:23 Emmanuel Panther delivers the ball. 14:07 The ball is delivered by Damian Spencer, clearance by Byron Anthony. 12:09 Corner taken right-footed by Luke Guttridge to the near post, save by Mikkel Andersen. 11:23 Floated corner taken by Luke Guttridge from the right by-line, Damian Spencer takes a shot. Mikkel Andersen makes a save. 10:58 Corner from the left by-line taken by Luke Guttridge, clearance made by Byron Anthony. 10:45 Danny Hylton takes a shot. Save by Mikkel Andersen. 10:27 John Akinde sends in a cross, John Halls makes a clearance. 9:26 John Halls sends in a cross, Close range header by Clayton Fortune goes over the bar. 9:03 Corner taken short by Luke Guttridge. 8:32 Free kick awarded for a foul by Jeff Hughes on Clayton Fortune. Free kick taken by Luke Guttridge. 4:51 Unfair challenge on Luke Guttridge by Jeff Hughes results in a free kick. Free kick taken by John Halls.